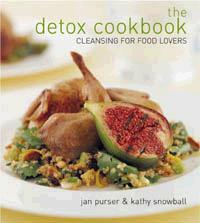 Jan Purser has years of experience with helping people undergo detox programs and digestive (gut) repair programs. Jan's award-winning book The Detox Cookbook explains how to detox in a healthy way while providing pages of great recipes to enjoy during the process. Jan recommends that all adults undergo an annual or twice yearly detox program to help keep their body functioning at its best. Time after time Jan Purser's patients report how much better they feel and look after a digestive repair and detox program. And, how energetic they feel. The detox programs are simple and not disruptive to daily life. They do require that you avoid some particular types of foods and drinks but they are not a fasting program nor are important nutrients missed. You can go on with your regular daily activities and you will be encouraged to exercise too. Jan may recommend you do a detox program if your Cellular Health Analysis test results show that you have fluid retention and toxicity issues. If you have symptoms showing poor digestion or food sensitivities. Or if preliminary testing indicates your body needs a "reboot". Once embarked on a detox program you are very likely to notice symptoms disappearing, you won't feel bloated and you will look sparky and healthy. Jan's detox program is easy to follow for everyone (not for children or pregnant women) with long-lasting results.